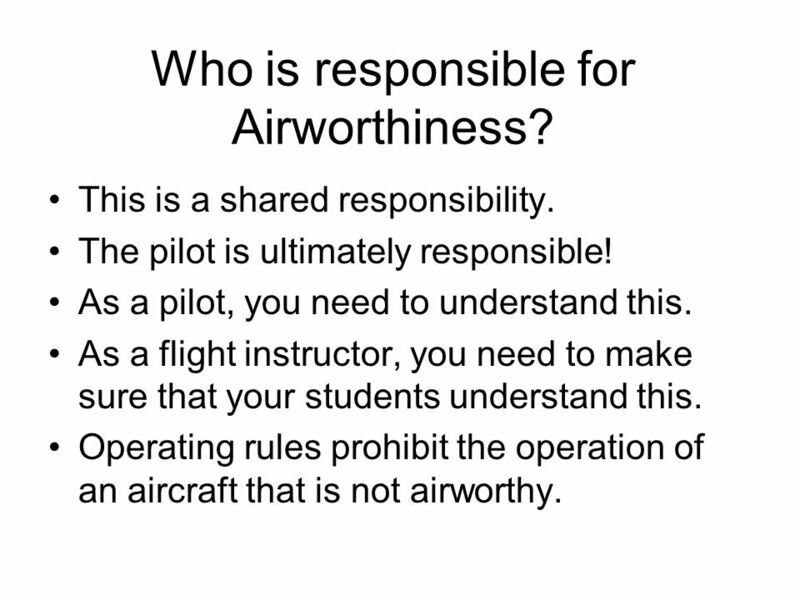 3 Who is responsible for Airworthiness? This is a shared responsibility. The pilot is ultimately responsible! As a pilot, you need to understand this. As a flight instructor, you need to make sure that your students understand this. 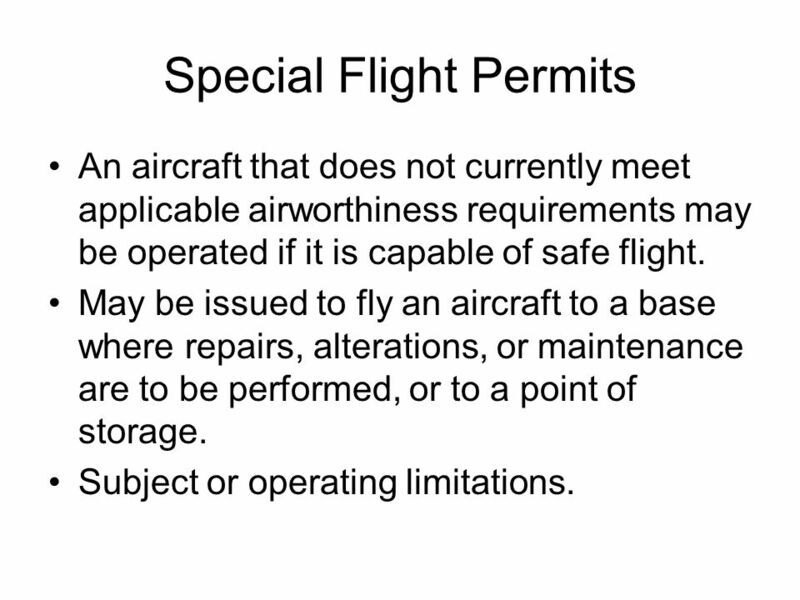 Operating rules prohibit the operation of an aircraft that is not airworthy. 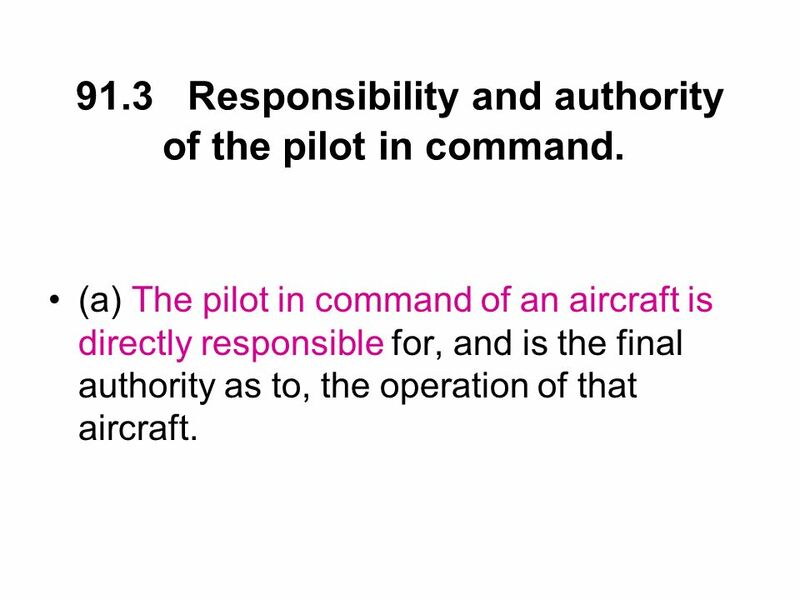 4 91.3 Responsibility and authority of the pilot in command. 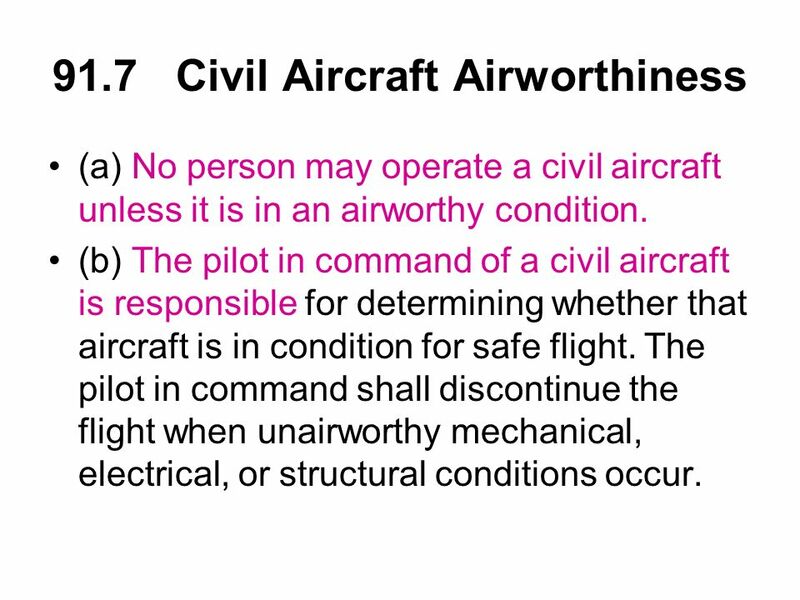 (a) No person may operate a civil aircraft unless it is in an airworthy condition. (b) The pilot in command of a civil aircraft is responsible for determining whether that aircraft is in condition for safe flight. The pilot in command shall discontinue the flight when unairworthy mechanical, electrical, or structural conditions occur. 6 91.403 General. 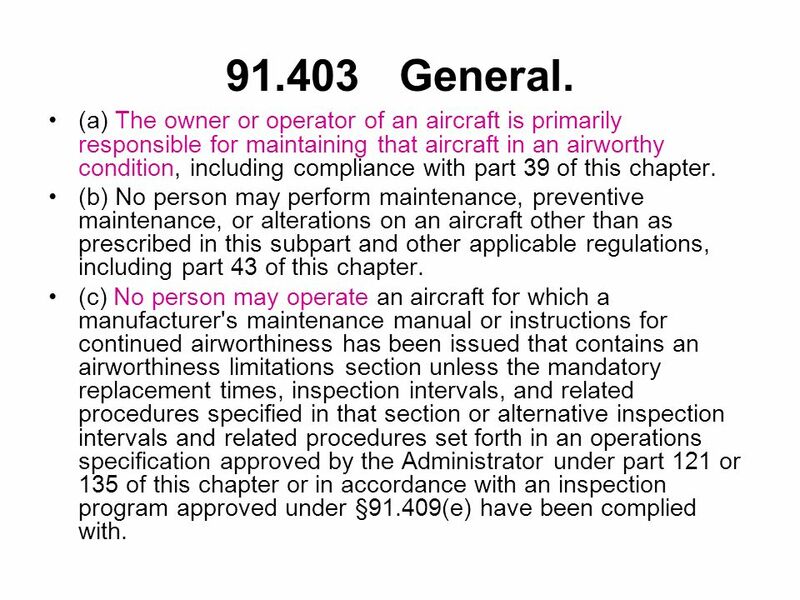 (a) The owner or operator of an aircraft is primarily responsible for maintaining that aircraft in an airworthy condition, including compliance with part 39 of this chapter. 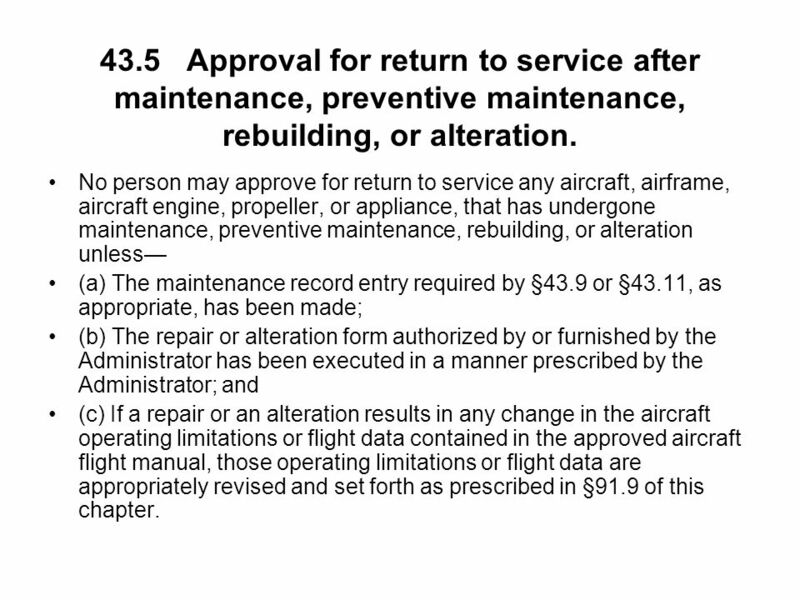 (b) No person may perform maintenance, preventive maintenance, or alterations on an aircraft other than as prescribed in this subpart and other applicable regulations, including part 43 of this chapter. (c) No person may operate an aircraft for which a manufacturer's maintenance manual or instructions for continued airworthiness has been issued that contains an airworthiness limitations section unless the mandatory replacement times, inspection intervals, and related procedures specified in that section or alternative inspection intervals and related procedures set forth in an operations specification approved by the Administrator under part 121 or 135 of this chapter or in accordance with an inspection program approved under §91.409(e) have been complied with. 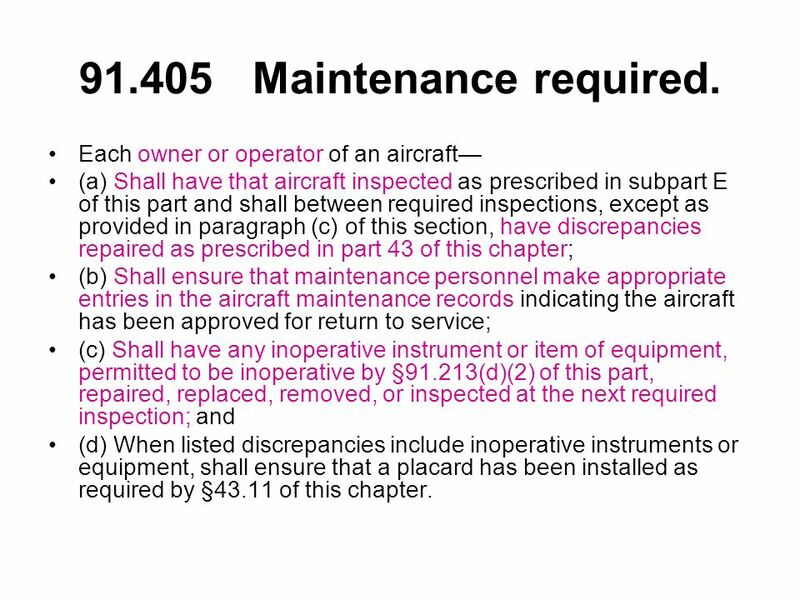 (a) Shall have that aircraft inspected as prescribed in subpart E of this part and shall between required inspections, except as provided in paragraph (c) of this section, have discrepancies repaired as prescribed in part 43 of this chapter; (b) Shall ensure that maintenance personnel make appropriate entries in the aircraft maintenance records indicating the aircraft has been approved for return to service; (c) Shall have any inoperative instrument or item of equipment, permitted to be inoperative by §91.213(d)(2) of this part, repaired, replaced, removed, or inspected at the next required inspection; and (d) When listed discrepancies include inoperative instruments or equipment, shall ensure that a placard has been installed as required by §43.11 of this chapter. 8 91.407 Operation after maintenance, preventive maintenance, rebuilding, or alteration. 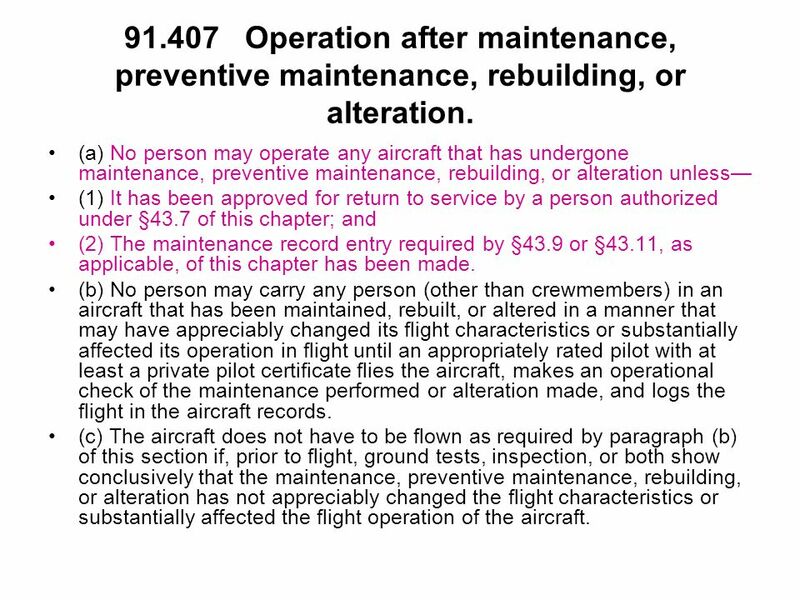 (a) No person may operate any aircraft that has undergone maintenance, preventive maintenance, rebuilding, or alteration unless— (1) It has been approved for return to service by a person authorized under §43.7 of this chapter; and (2) The maintenance record entry required by §43.9 or §43.11, as applicable, of this chapter has been made. (b) No person may carry any person (other than crewmembers) in an aircraft that has been maintained, rebuilt, or altered in a manner that may have appreciably changed its flight characteristics or substantially affected its operation in flight until an appropriately rated pilot with at least a private pilot certificate flies the aircraft, makes an operational check of the maintenance performed or alteration made, and logs the flight in the aircraft records. 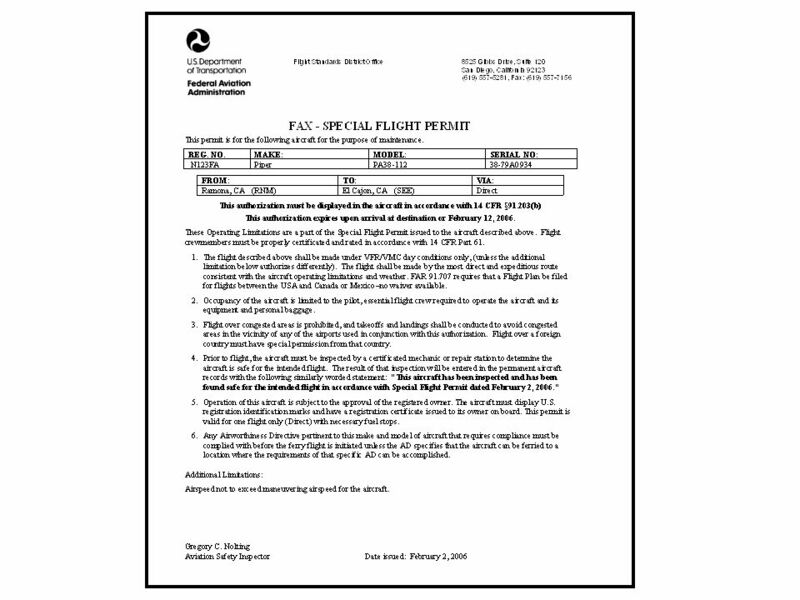 (c) The aircraft does not have to be flown as required by paragraph (b) of this section if, prior to flight, ground tests, inspection, or both show conclusively that the maintenance, preventive maintenance, rebuilding, or alteration has not appreciably changed the flight characteristics or substantially affected the flight operation of the aircraft. 9 Responsibility may be shared, MAYBE. 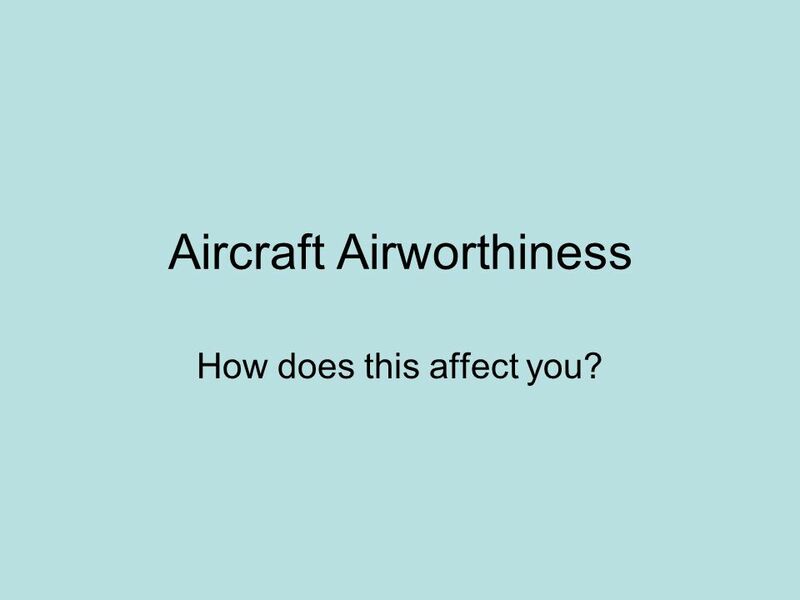 Depending on who you’re working for, you may have a partner in the responsibility for airworthiness. Shared responsibility is limited. You are ultimately responsible for the condition of the aircraft that you operate. Will your partner stand up for you? Choose your partners carefully. 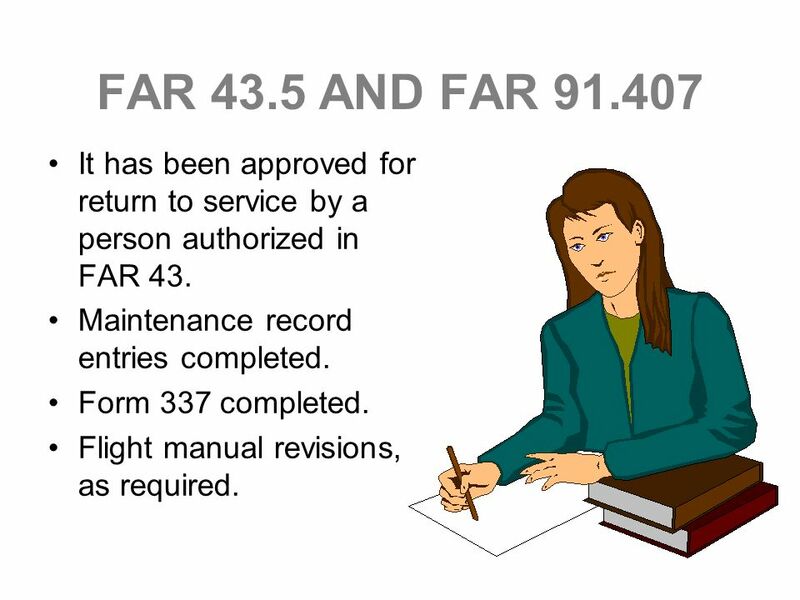 10 43.5 Approval for return to service after maintenance, preventive maintenance, rebuilding, or alteration. 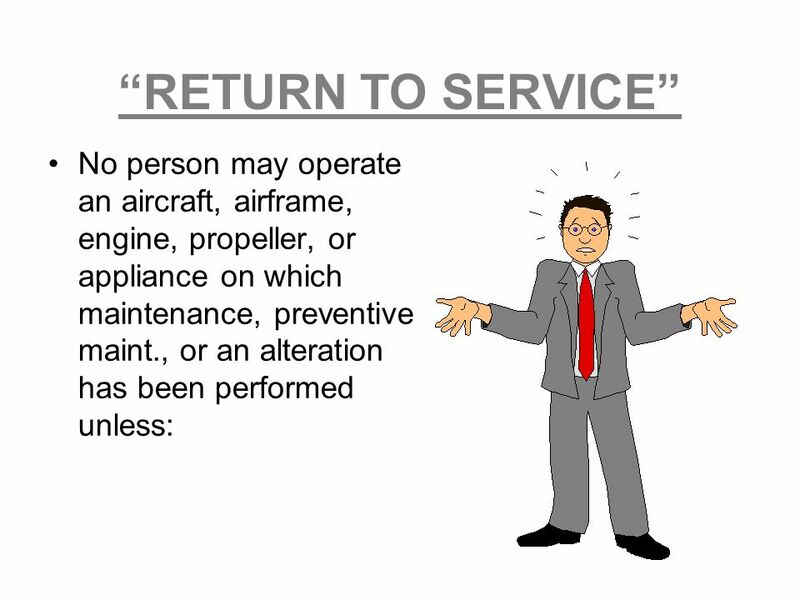 No person may approve for return to service any aircraft, airframe, aircraft engine, propeller, or appliance, that has undergone maintenance, preventive maintenance, rebuilding, or alteration unless— (a) The maintenance record entry required by §43.9 or §43.11, as appropriate, has been made; (b) The repair or alteration form authorized by or furnished by the Administrator has been executed in a manner prescribed by the Administrator; and (c) If a repair or an alteration results in any change in the aircraft operating limitations or flight data contained in the approved aircraft flight manual, those operating limitations or flight data are appropriately revised and set forth as prescribed in §91.9 of this chapter. 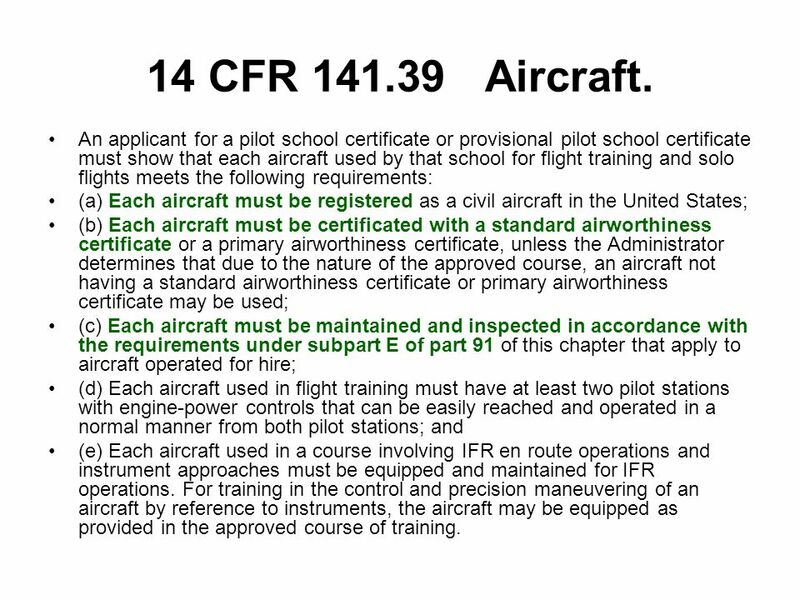 11 14 CFR Aircraft. 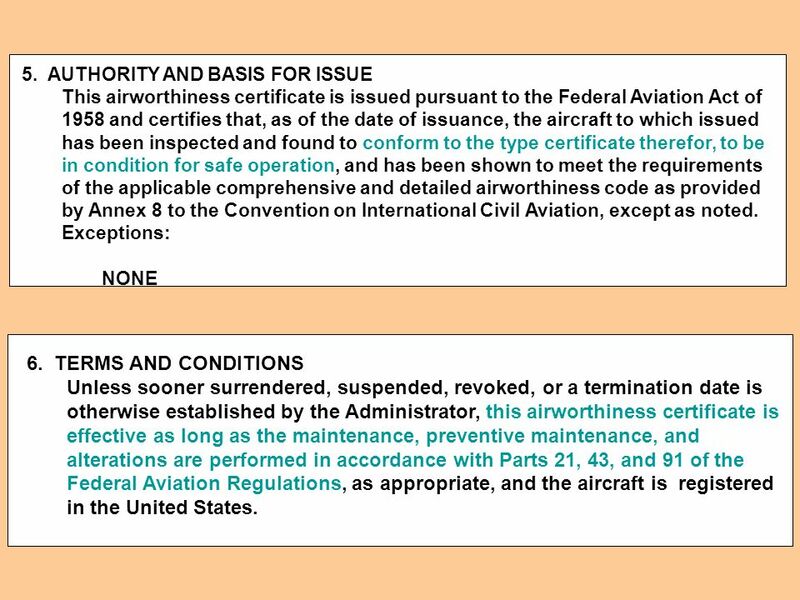 An applicant for a pilot school certificate or provisional pilot school certificate must show that each aircraft used by that school for flight training and solo flights meets the following requirements: (a) Each aircraft must be registered as a civil aircraft in the United States; (b) Each aircraft must be certificated with a standard airworthiness certificate or a primary airworthiness certificate, unless the Administrator determines that due to the nature of the approved course, an aircraft not having a standard airworthiness certificate or primary airworthiness certificate may be used; (c) Each aircraft must be maintained and inspected in accordance with the requirements under subpart E of part 91 of this chapter that apply to aircraft operated for hire; (d) Each aircraft used in flight training must have at least two pilot stations with engine-power controls that can be easily reached and operated in a normal manner from both pilot stations; and (e) Each aircraft used in a course involving IFR en route operations and instrument approaches must be equipped and maintained for IFR operations. For training in the control and precision maneuvering of an aircraft by reference to instruments, the aircraft may be equipped as provided in the approved course of training. 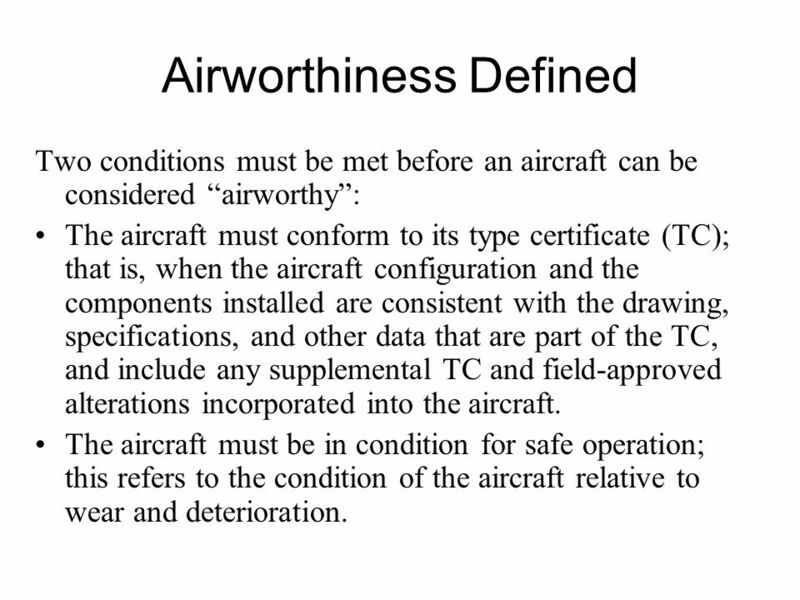 Two conditions must be met before an aircraft can be considered “airworthy”: The aircraft must conform to its type certificate (TC); that is, when the aircraft configuration and the components installed are consistent with the drawing, specifications, and other data that are part of the TC, and include any supplemental TC and field-approved alterations incorporated into the aircraft. The aircraft must be in condition for safe operation; this refers to the condition of the aircraft relative to wear and deterioration. 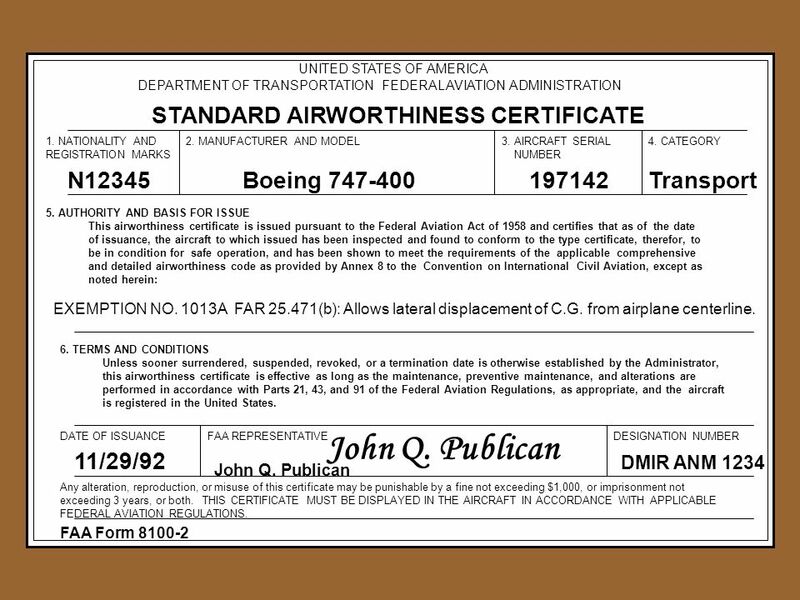 This airworthiness certificate is issued pursuant to the Federal Aviation Act of 1958 and certifies that, as of the date of issuance, the aircraft to which issued has been inspected and found to conform to the type certificate therefor, to be in condition for safe operation, and has been shown to meet the requirements of the applicable comprehensive and detailed airworthiness code as provided by Annex 8 to the Convention on International Civil Aviation, except as noted. Exceptions: NONE 6. 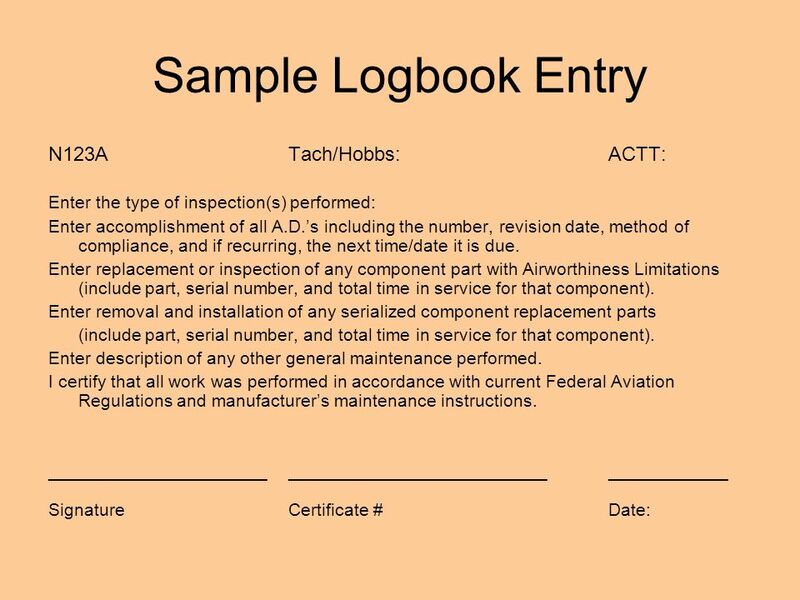 TERMS AND CONDITIONS Unless sooner surrendered, suspended, revoked, or a termination date is otherwise established by the Administrator, this airworthiness certificate is effective as long as the maintenance, preventive maintenance, and alterations are performed in accordance with Parts 21, 43, and 91 of the Federal Aviation Regulations, as appropriate, and the aircraft is registered in the United States. 17 What is a repair? 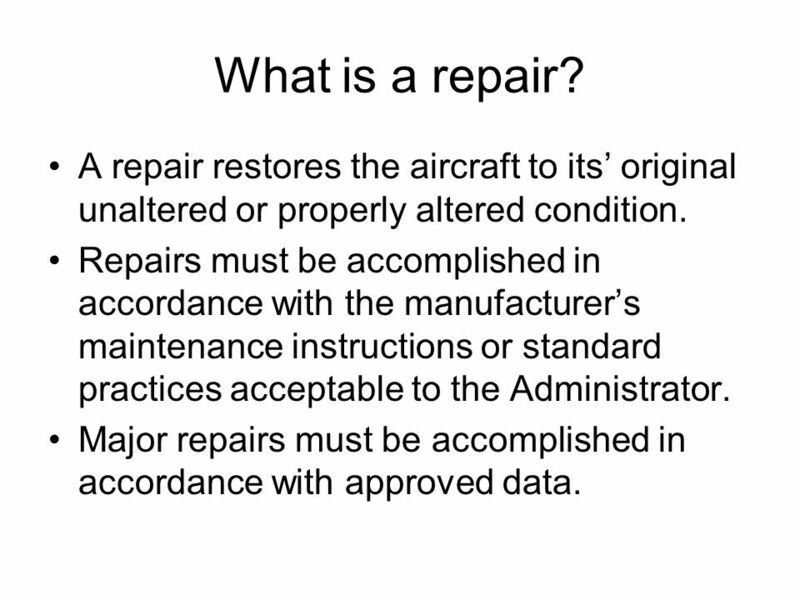 A repair restores the aircraft to its’ original unaltered or properly altered condition. Repairs must be accomplished in accordance with the manufacturer’s maintenance instructions or standard practices acceptable to the Administrator. Major repairs must be accomplished in accordance with approved data. 18 Major vs. Minor Repair Major Repair. A repair that fits one or more of the following: (1) Might appreciably affect airworthiness by changing weight, balance, structural strength, performance, powerplant operation, or flight characteristics if improperly done; or (2) Is not done according to accepted practices or cannot be done by elementary operations. Minor Repair. 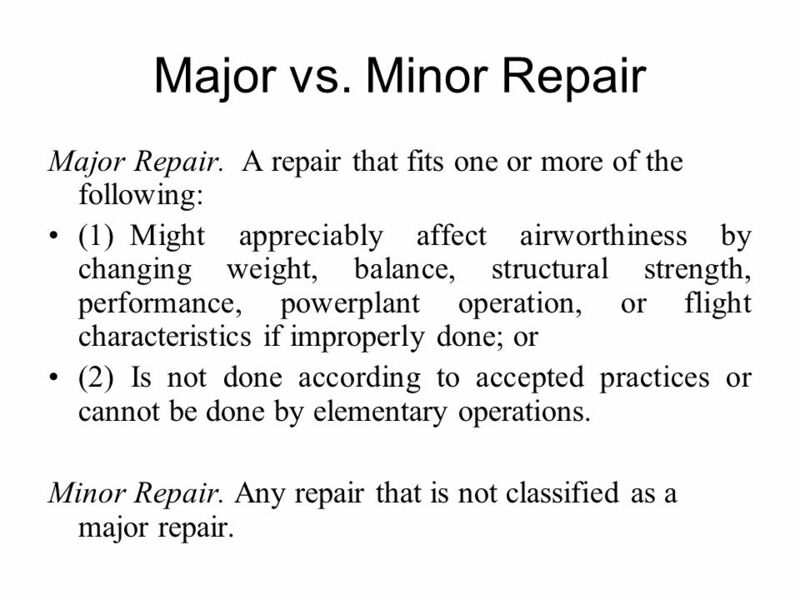 Any repair that is not classified as a major repair. An aircraft that does not currently meet applicable airworthiness requirements may be operated if it is capable of safe flight. 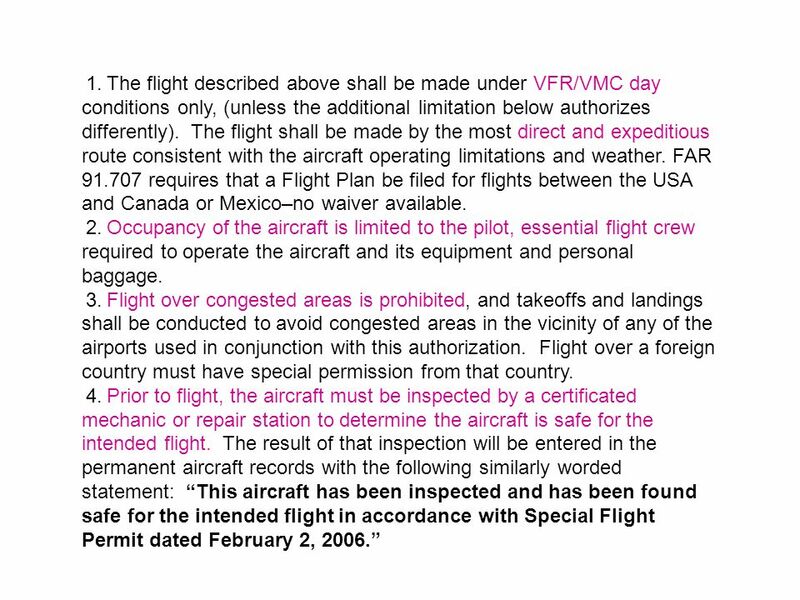 May be issued to fly an aircraft to a base where repairs, alterations, or maintenance are to be performed, or to a point of storage. Subject or operating limitations. 21 1. 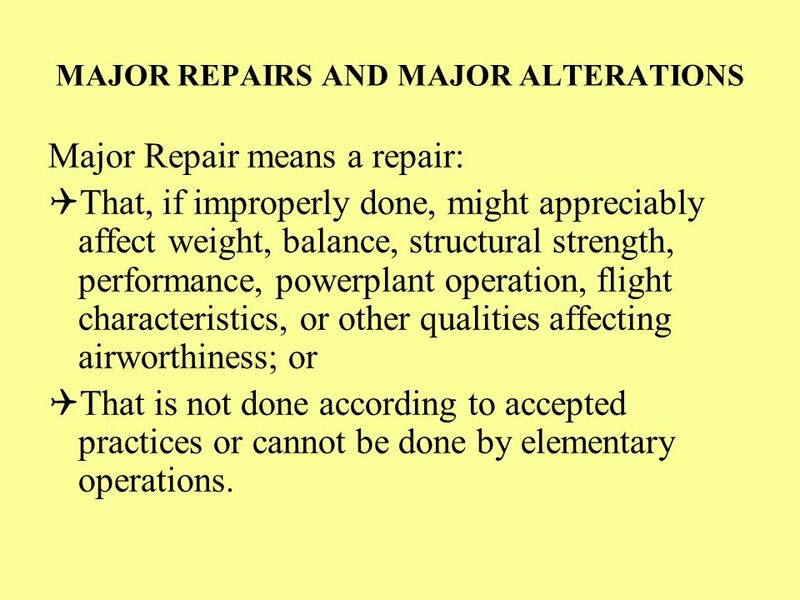 Ask someone to give the definition of a Major Repair. 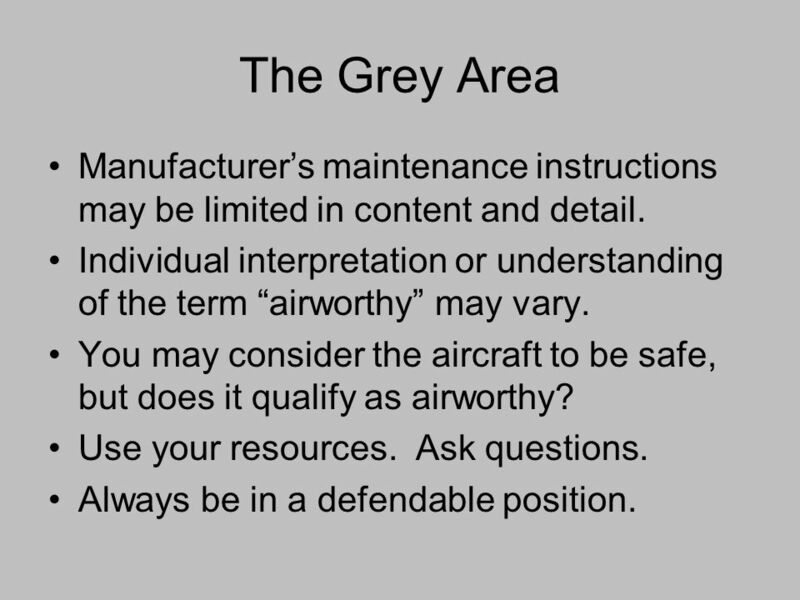 23 The Grey Area Manufacturer’s maintenance instructions may be limited in content and detail. 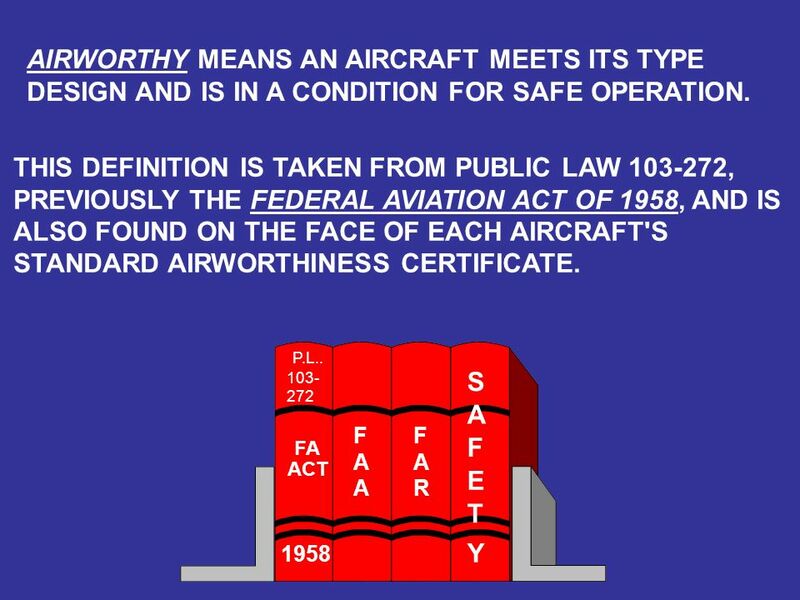 Individual interpretation or understanding of the term “airworthy” may vary. You may consider the aircraft to be safe, but does it qualify as airworthy? Use your resources. Ask questions. Always be in a defendable position. 24 What to look for: Verify that scheduled maintenance requirements are current. Verify that there are no open discrepancies (unscheduled). 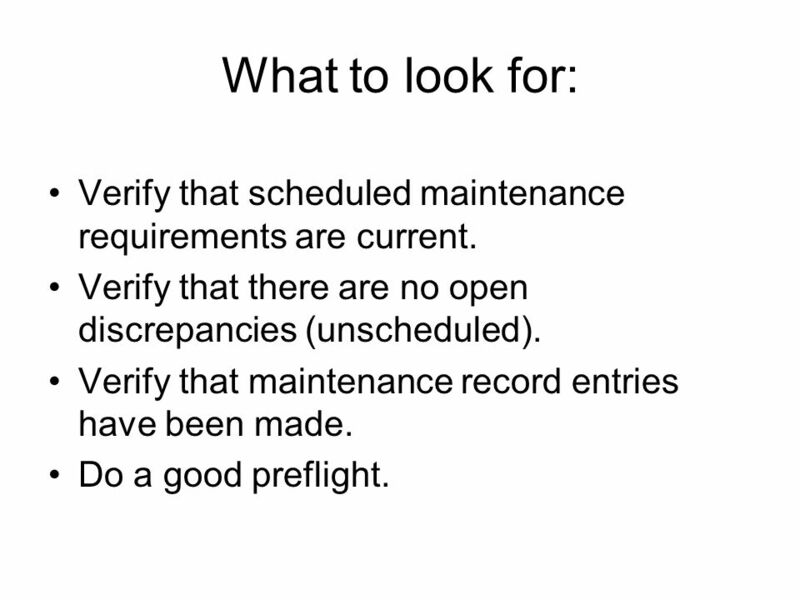 Verify that maintenance record entries have been made. Do a good preflight. 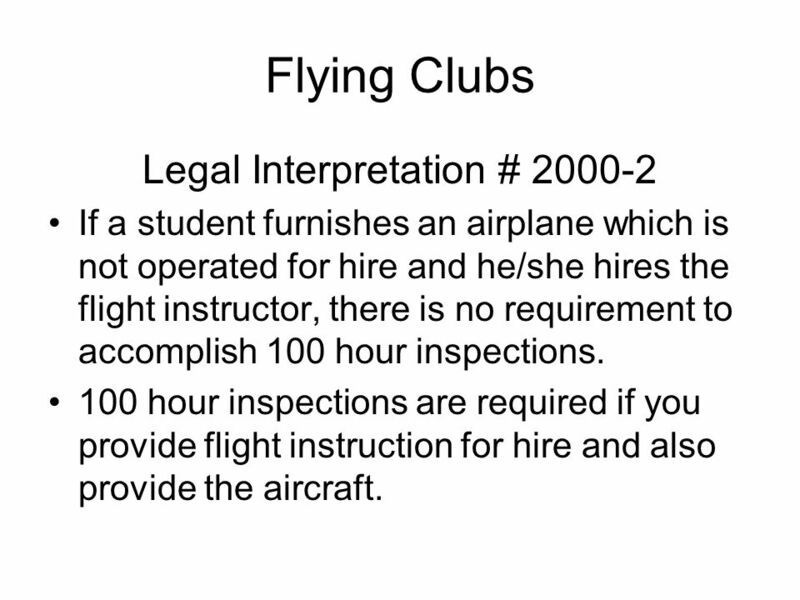 Flying Clubs Legal Interpretation # If a student furnishes an airplane which is not operated for hire and he/she hires the flight instructor, there is no requirement to accomplish 100 hour inspections. 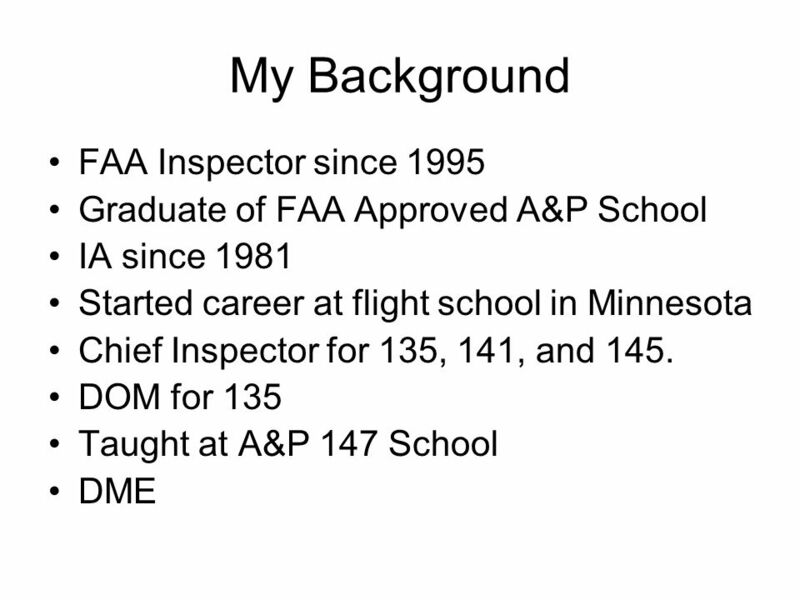 100 hour inspections are required if you provide flight instruction for hire and also provide the aircraft. Line gripes How are they reported? Who decides what gets repaired? 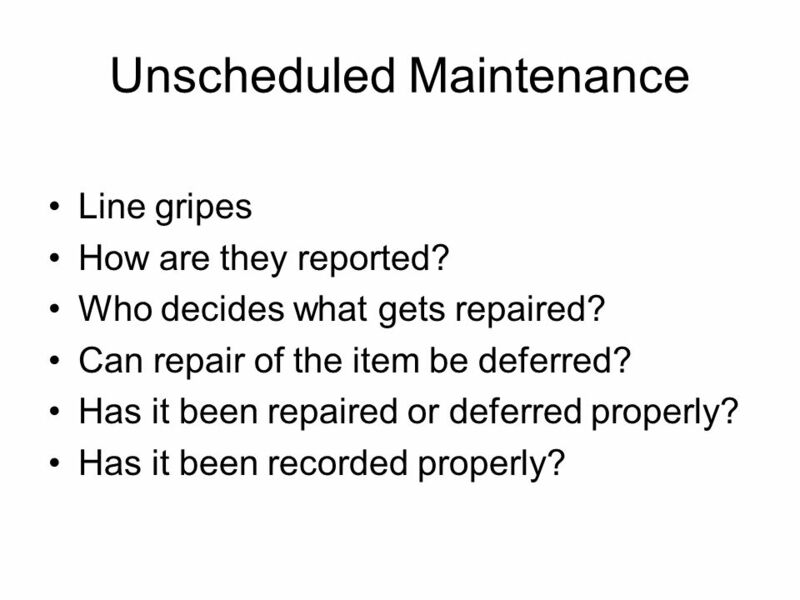 Can repair of the item be deferred? Has it been repaired or deferred properly? Has it been recorded properly? 29 Records of the maintenance, preventive maintenance, alterations, 100 hour, annual, progressive and other required or approved inspections, as appropriate. 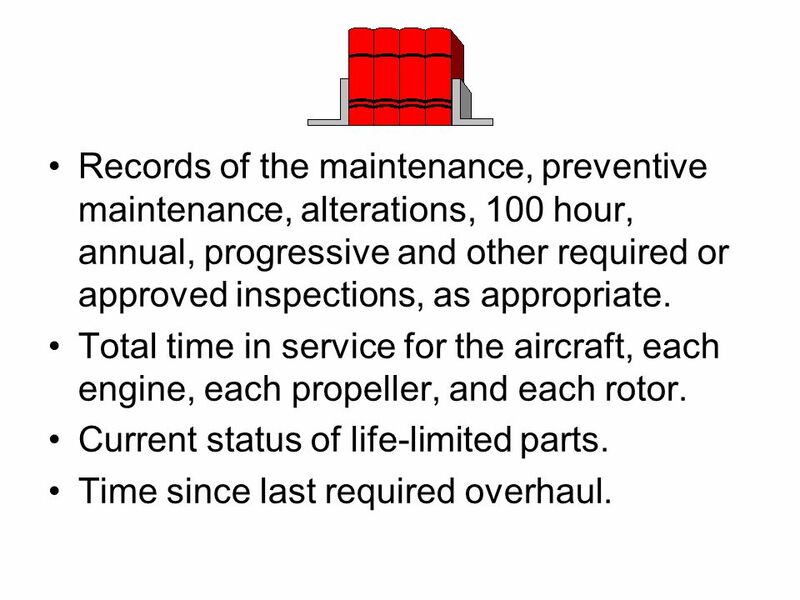 Total time in service for the aircraft, each engine, each propeller, and each rotor. Current status of life-limited parts. Time since last required overhaul. Copies of FAA Form 337 for any major alterations performed. 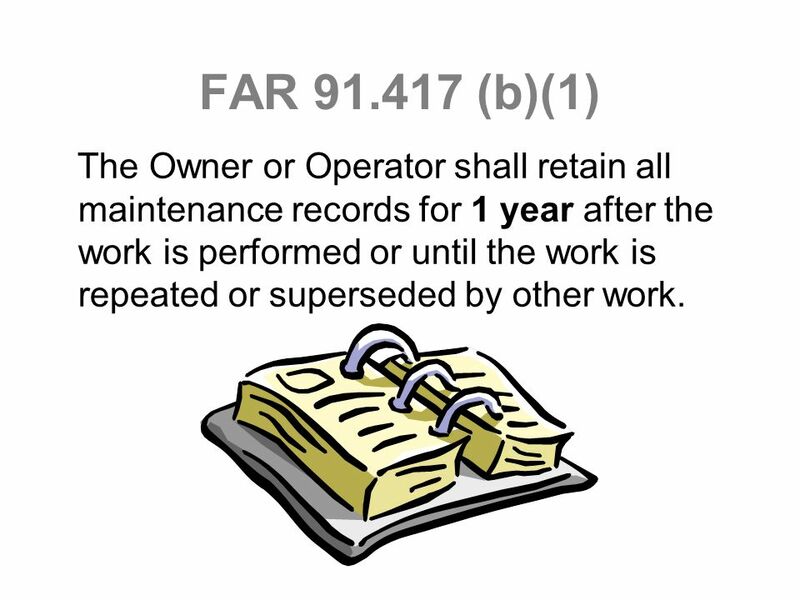 31 FAR (b)(1) The Owner or Operator shall retain all maintenance records for 1 year after the work is performed or until the work is repeated or superseded by other work. 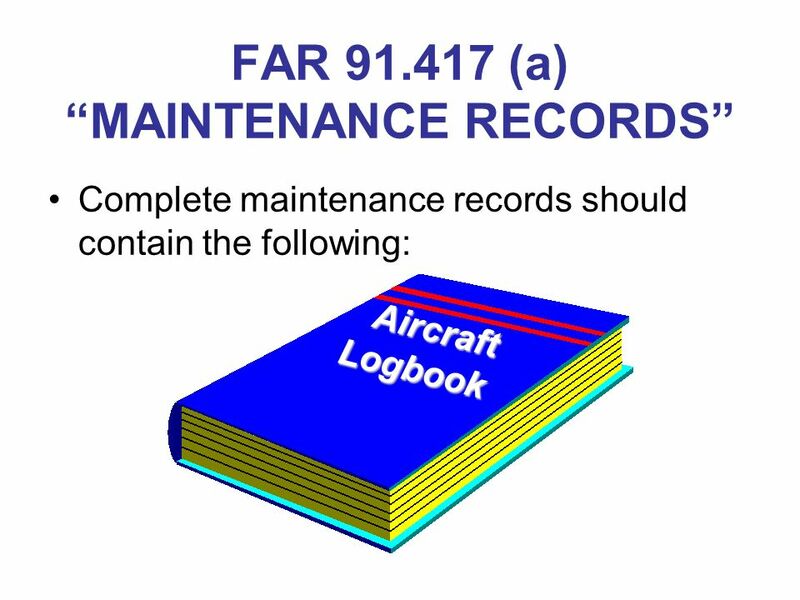 32 FAR (b)(2) After one year, some maintenance records do not have to be retained. 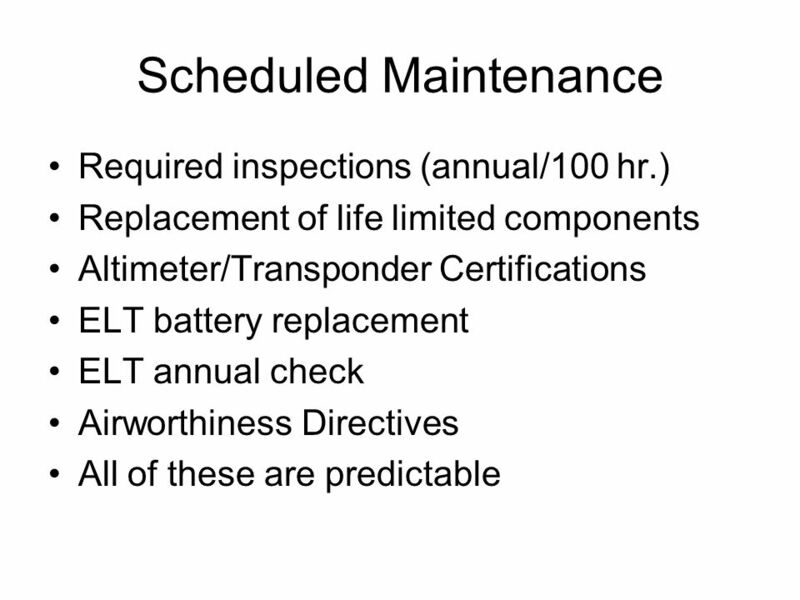 For the most part, this only pertains to repairs and unscheduled maintenance. 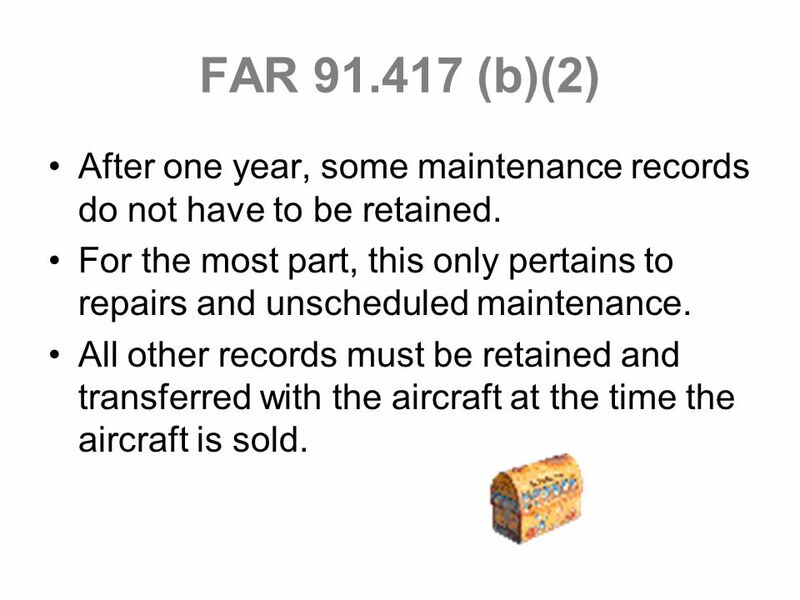 All other records must be retained and transferred with the aircraft at the time the aircraft is sold. 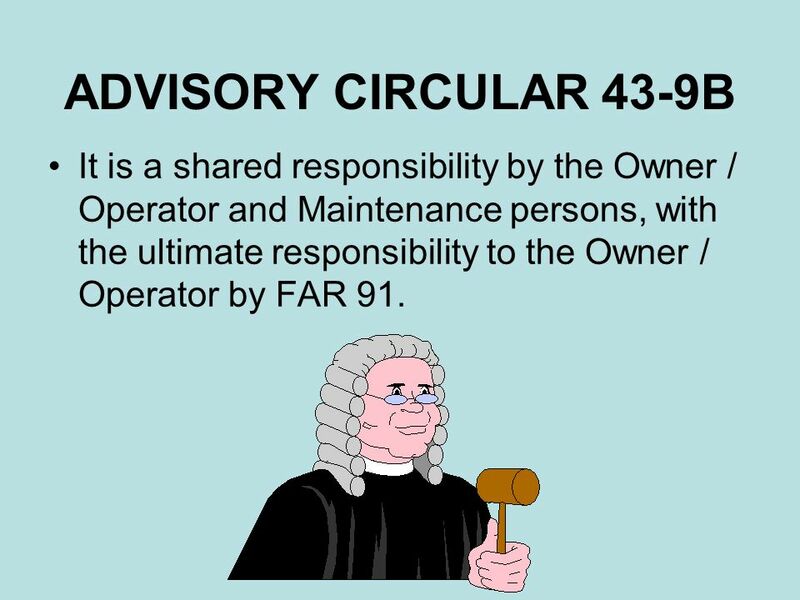 33 ADVISORY CIRCULAR 43-9B It is a shared responsibility by the Owner / Operator and Maintenance persons, with the ultimate responsibility to the Owner / Operator by FAR 91. 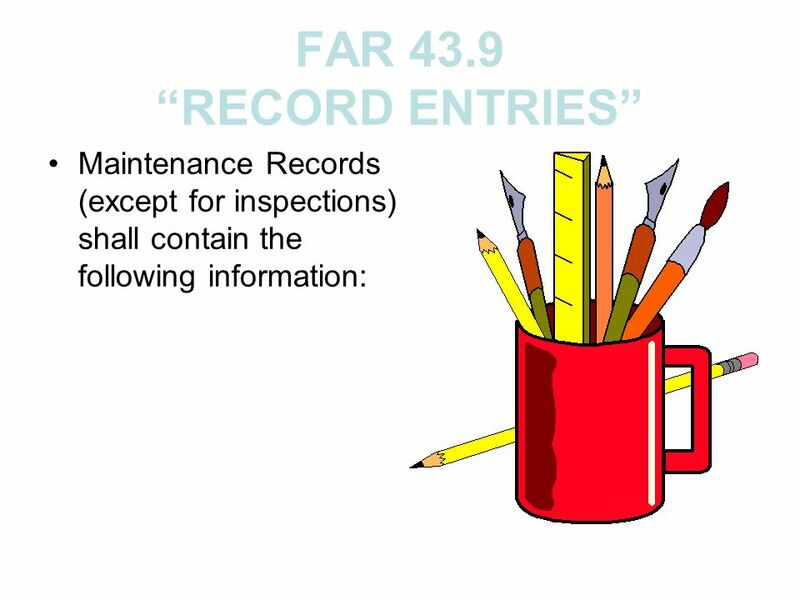 35 FAR 43.5 AND FAR It has been approved for return to service by a person authorized in FAR 43. Maintenance record entries completed. Form 337 completed. Flight manual revisions, as required. 37 A description (or reference to data) of work performed. The date of completion of the work. 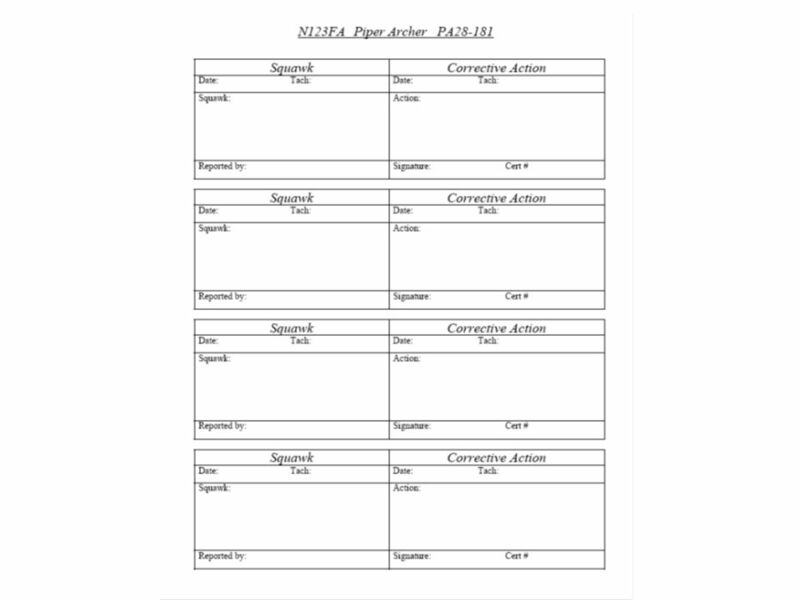 The name of the person performing the work if other than specified below. 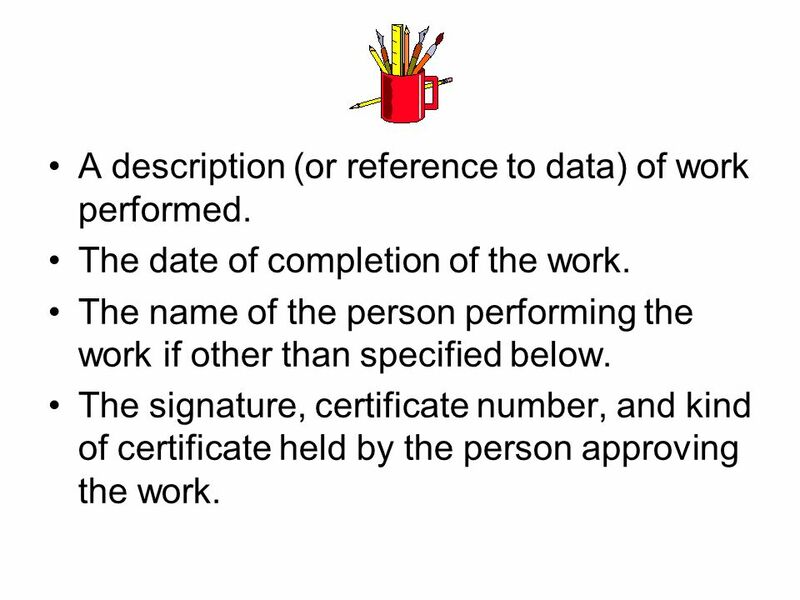 The signature, certificate number, and kind of certificate held by the person approving the work. 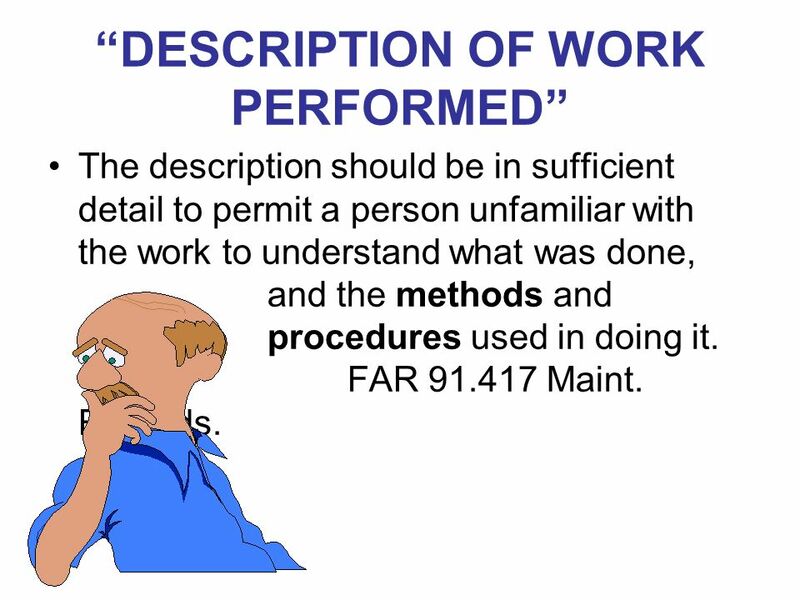 The description should be in sufficient detail to permit a person unfamiliar with the work to understand what was done, and the methods and procedures used in doing it FAR Maint. Records. 40 The type of inspection and a brief description of the extent of the insp. The date of the inspection and the total time in service. 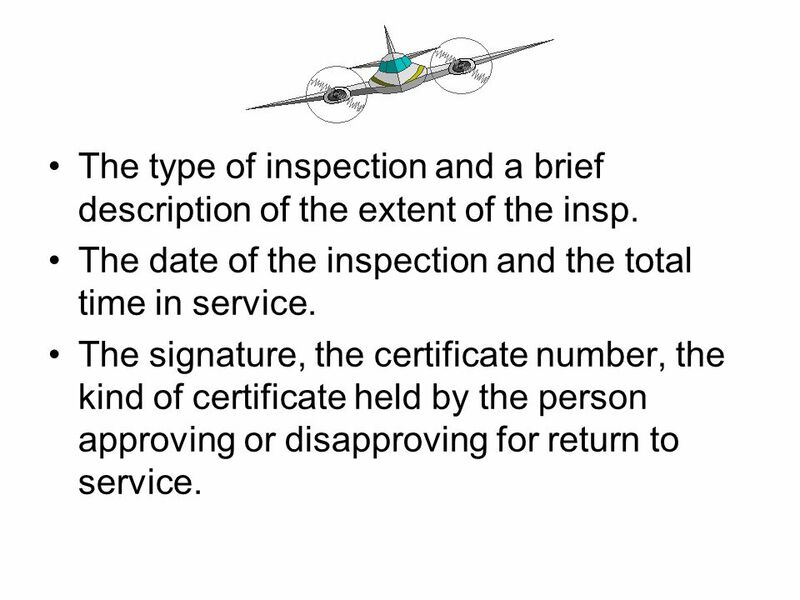 The signature, the certificate number, the kind of certificate held by the person approving or disapproving for return to service. 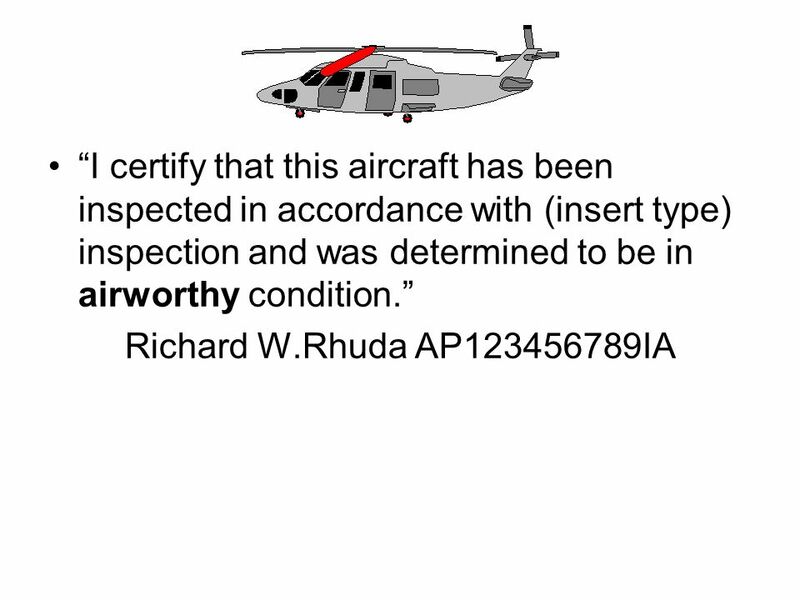 TYPE CERTIFICATES FOR IMPORTED AIRCRAFT Cooperative Development of Operational Safety & Continuing Airworthiness COSCAP. Presented by the FAA Safety Team FY 2012 Federal Aviation Administration Light Sport Aircraft Operation / Maintenance. Airworthy or Not? Pre-flight Inspections & other stuff An Engineer’s Perspective. 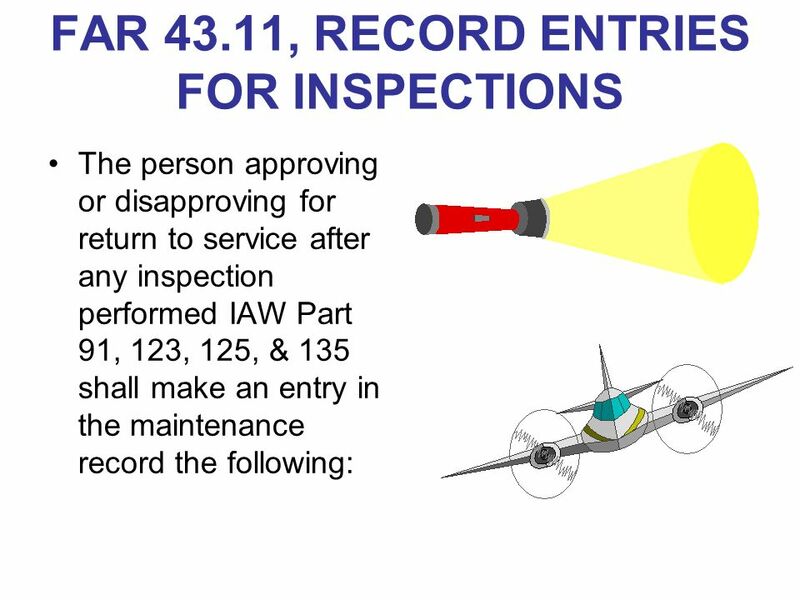 AIRCRAFT INSPECTION INSPECTION PROCESS. The Art of Inspection What inspection What inspection Who can inspect Who can inspect Phases of inspection Phases.